Getting on your bicycle can give you an enormous sense of freedom and enjoyment. It can increase your independence and knowledge of the local area, and improve your access to the natural (or urban) environment. It can also be highly nostalgic – reminding you of your childhood cycle rides and the joy of being young. But beyond the feelgood factor, can cycling actually make any difference to mental abilities and wellbeing? This was something our new study aimed to investigate – specifically looking at cycling among older adults. While most studies incorporate exercise in a gym situation, our study wanted to examine the impact of cycling in the real world – outside a controlled environment. So older adults, aged 50 and above, were asked to cycle for at least an hour and a half each week for an eight-week period. Participants either cycled on a conventional pedal bike, on an electrically assisted “e-bike” or were instructed to maintain their regular non-cycling exercise routine as a comparison group. Mental abilities, mental health and wellbeing were measured before and after the eight-week cycling period. Exercise is thought to improve mental functioning through increased blood flow to the brain – as well as encouraging regrowth of cells, specifically in the hippocampus. This is known to be an area associated with memory. So it was expected that the greater physical exertion required for pedal cycling, compared to cycling an e-bike with a motor, would result in greater benefits to mental functioning. One of the tasks we used to measure mental ability is the “Stroop test”. The task involves participants being shown the name of a colour printed on a card in a different colour script – imagine the word “blue” printed in red ink. Participants are asked to say the colour of the ink that the word is printed in, rather than reading the name of the colour. The Stroop test measures how accurately someone is able to minimise distraction from the written word when reporting the ink colour. We found that after eight weeks of cycling, both pedal and e-bike cycling groups were better at ignoring the written word, indicating that their mental function had improved. This was not the case for non-cycling control participants. Aside from the benefits found to some mental abilities, we also saw a trend for mental health improving for the e-bike cyclists, but pedal cyclists did not change on this measure. This could be because e-bikes may be more enjoyable and easier to ride than normal pedal bikes – helping to improve mental wellbeing. We also found e-bike cyclists spent more time cycling on average each week than the pedal cyclists. Many of the participants commented that they felt they could go further on the e-bike as they could rely on the motor to get them home if they could not manage it by themselves. 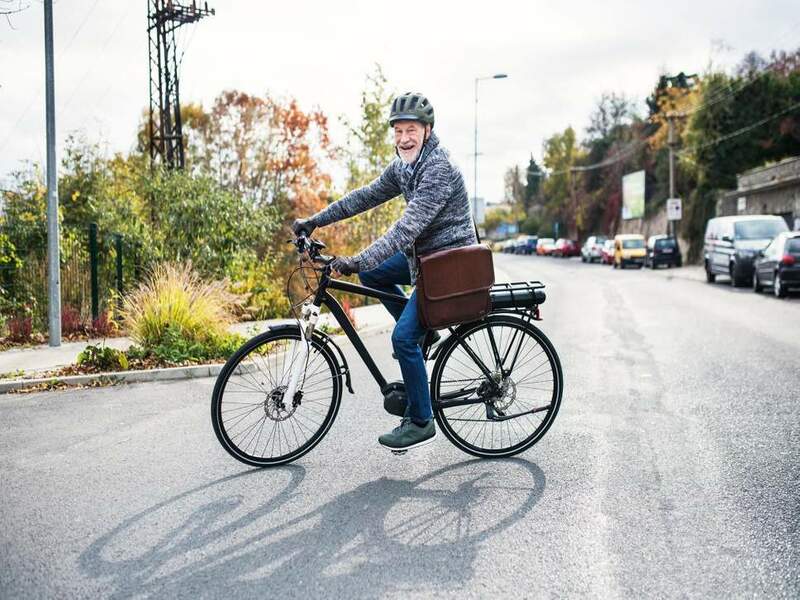 It seems, then, that e-bikes have the potential to re-engage older adults with cycling and provide a great opportunity to increase physical activity and engagement with the outdoor environment. So, given that more than three million older people in the UK live alone, of whom more than two million are over 75, it might just be that the use of an electric bicycle could help to improve older people’s lives by increasing independence and mobility – all of which can have a significant impact on their wellbeing.